Thanks Rachel for this photo! PS: I like that 3D Nuffnang Logo very much!! 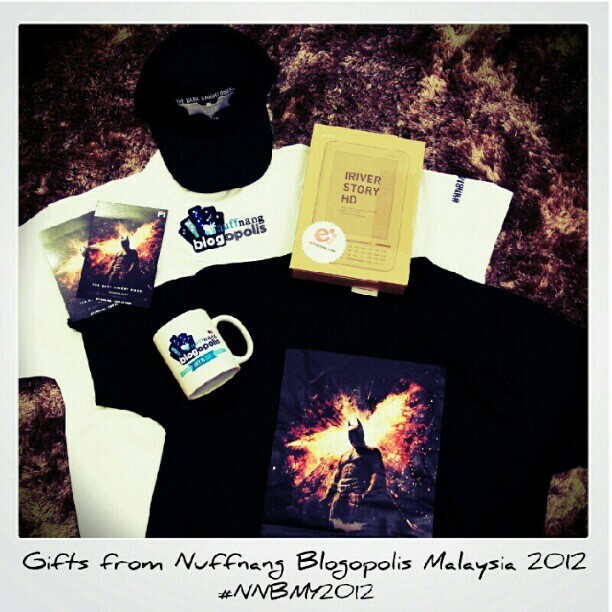 These are all the gifts that I got from Nuffnang Blogopolis 2012 Malaysia. Besides the oversize #NNBMY2012 Polo-shirt (I wish I was given M-size instead of L...) and the cup (I like this!). I won a few Batman a.k.a. Dark Night Rises Merchandise from P1 Twitter Trivia. It was easy to win though haha! AND... After numerous spam tweets about #MPHiRiverHD during #NNBMY2012, I finally got to bring back a new gadget home~ iRiver Story HD that cost RM500. Congratz to other winners as well! Thanks to all friends who followed me on Twitter for tolerate my sudden-stream-of-MPH-Tweets. Haha. I like XiaXue's personality as she just dare to say what she feel and learn a lot from her sharing that day. Hope to see little XiaXue or little Mike in few years time? Till then, stay tune for my photo stories~!